B - Director Nikita Mikhalkov has tackled a "re-imagining" of the archetypal Serious American Drama with verve, slashing up the most conspicuous aspects of Twelve Angry Men, particularly its claustrophobic narrative and staging under Sidney Lumet. While Mikhalkov's 12 is far too graceless to stand at the same podium as Reginald Rose's seminal legal fable, the new film is provocative in its use of expansive flashbacks and long, personal monologues from the jurors. Notably, 12 swaps Henry Fonda's rational, persuasive Juror No. 8 for an anxious second-guesser, whose own experiences prohibit a rash decision about the defendant's fate. One senses that Mikhalkov is both paying tribute to and riffing on Lumet's palatable moralizing, not to mention the American judicial system so routinely fetishized in fiction. While the film takes its facile swipes at apathy and racism, it also poses more probing questions about the limits of speculation, culpability, and civic obligation. 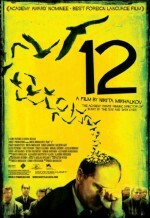 For these reasons, 12 is a worthy Russian response film to an iconic work of American drama, despite its often clumsy gestures towards humanizing grit. Never mind his silly flourishes and narrative dead-ends; Mikhalkov deserves praise for reconfiguring a lionized story within a new milieu, adding curiosities and complexity.